Do you remember the television commercials for the now-long-gone department store that had a customer standing at the door, peering in, saying “open open open”? Quiltstock 2018. The Magnolia Park Cities Hotel in Dallas, Texas. Coincidentally, during a spell of record-setting heat. Not that that deterred anybody from having a whole lot of fun. So what is – was – Quiltstock? 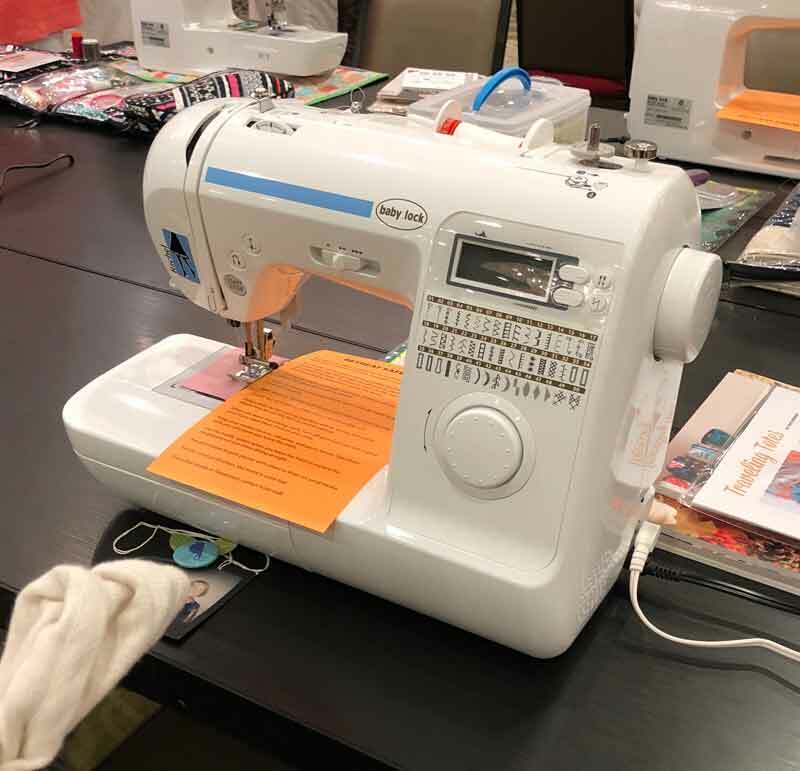 It was the first-ever retreat created for quilters and retail customers by Martingale Publishing and Moda Fabrics. Over 100 fabric-mad, gotta-make-something-now creatives gathered from all over the United States for four days of fun. Five if they had signed up for the Shopportunity Event – a trip to Magnolia Market in Waco. There were two buses – quickly named Joanna and Chip. Box lunches were Joanna’s justifiably famous Chicken Salad Sandwiches, provided by The Magnolia Table restaurant – a first-ever project for them. Now that the retreat is over, the dust has settled, the suitcases and boxes have been unpacked… and the surprises have been sprung, we can share some of the goings-on. You know… should you want to attend Quiltstock 2. The event was preceded by a retreat for shop owners, that ended Sunday morning. Some stayed for the trip to Waco, and others arrived. That trip was Monday, July 23rd. But on Sunday night… the room was readied for Monday. It felt a little like waiting for the curtain to rise at a show. Quiltstock participants had their official Registration and Check-In on Monday afternoon. Lanyards and badges were dispensed, kits provided and a swag-goodie bag was waiting at each work station. An Opening Reception began at 7:00 pm with introductions of staff and teachers, and a few special guests – Mark Dunn, the Founder and Owner of Moda Fabrics, and various Directors at Moda Fabrics, including Josh Dunn, Cheryl Freydberg, David Beadle and Lissa Alexander. That’s Mr. Dunn with Roseanne Meehan Kermes – shop-owner, author, event-planner, organizer and awesome person extraordinaire. The Mistress of Ceremonies at the Opening Reception – and for much of the event – was Martingale’s CVO Jennifer Keltner. That’s Jennifer on the left with Karen Johnson, Martingale’s Director of Marketing. They’re smiling because after well over a year in planning, they’re about to get the party retreat started. After reminding us to play, to have fun and be creative, we were off to the main Ballroom and the sewing machines. While a few people brought their own machines, most used one of the terrific machines provided by Baby Lock USA and Tacony. They provided almost 150 sewing machines for the event – their Rachel and Katherine models – and each and every one worked beautifully. It goes without saying that this retreat could not – would not – have happened without their support and generosity. So a huge “Thank you” to Victor Del Moral, the Regional Manager at Baby Lock USA and Rick from the Plano Sewing Center. Terry Atkinson’s Traveling Totes pattern was the “activity du jour” – a simple project that allowed everyone to become familiar with their machines. On Tuesday, the fun started. The group was divided into four “pods” and each pod had two classes on Tuesday. Upon returning to their machines after every break or meal, there were gifts left for each person. From notebooks to zipper bags, bookmarks to a pincushion, the goal of the staffs from Martingale and Moda was to make everyone feel special and appreciated. If you’re wondering how a hotel ballroom was turned into a terrific quilting classroom – heavy-duty foam core boards. They measure 4′ x 8′ x 1″ thick. But for some things, a more hands-on approach and demo is required. Two sisters-teachers? Twice the knowledge! That is not Lisa’s class project but after being asked to share the project she was stitching during breaks, Lisa happily shared her knowledge. If you had a chance to learn wool appliqué from a master-craftswoman, I think you’d be asking too. The block is from Twilight Garden – it is made with neutral wools appliquéd on a deep Navy blue background. This is the 2018 Summer Block of the Week for Lisa’s shop, Primitive Gatherings. Wednesday morning was Open Sewing – because, well, 1200 flying geese. After another mouth-watering, plate-cleaning buffet lunch, the afternoon was spent with Session 3 of the classes. Kathy Schmitz. Did you know she’s a lefty? Me either. She was asked to sign a lot of books. Thursday was flipped – a class session in the morning and Open Sewing after lunch and dinner. There were four groups – The Churn Dash Chicks, the Outa-Sight Hourglasses, the Far-Out Four-Patches and the Piece-nik Pinwheels. One of the giveaways involved each group selecting a Representative. Think a cross between The Price is Right and Let’s Make A Deal… the representative had to choose a number, essentially guessing which bag of goodies was the one most desired by their group. Guess what? Everybody was thrilled with what they won! There were mini trunk shows in the evening by the teachers at retreat and by Moda’s own Director of Marketing, Lissa Alexander. You have seen her terrific book Oh, Scrap!, right? A few people may have needed two boxes. Just saying. On Friday morning, we made pillowcases for charity. Moda provided pre-cut kits and in a little over one hour, 126 pillowcases were finished. They have been delivered to the Scottish Rite Hospital, a non-profit, pediatric, orthopedic hospital in Dallas. That’s when it was time for Jennifer to return to the podium and say a few closing words – ending with a HUGE thank you to everyone who attended, worked, supported the event, shared goodies, etc. Good-byes were said, contact information exchanged, and lots of pictures were taken. 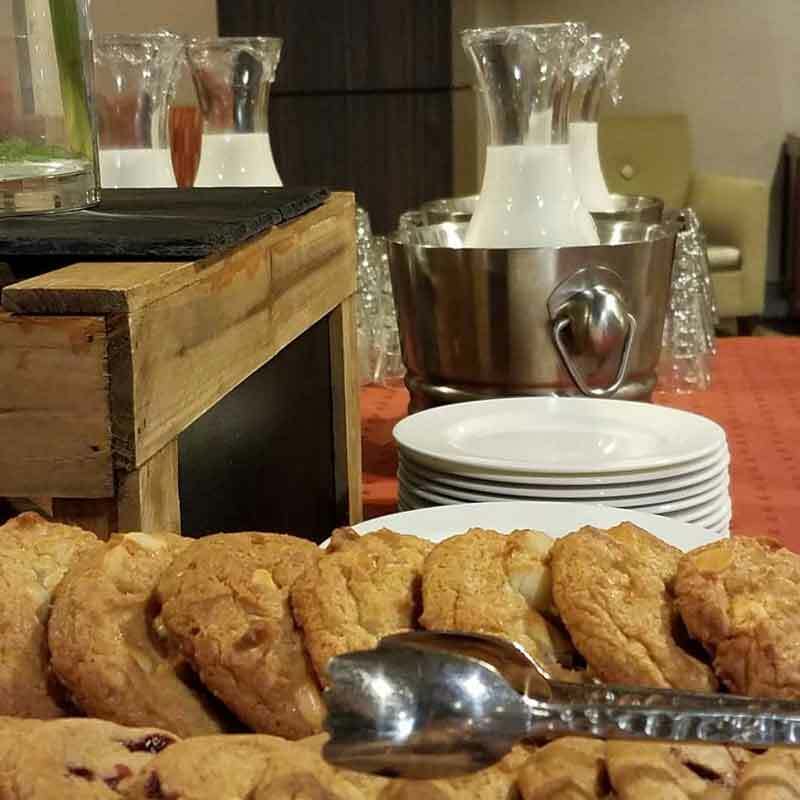 And we must also thank the entire staff of the Magnolia Park Cities Hotel for taking such good care of us. Their kindness, courtesy and “please let us know if there anything you need” spirit was a big reason why everyone had such a great time. Discussions have already begun about Quiltstock 2. We don’t know when or where it will be but rest assured that as soon as we have details, we’ll share it with you. Next Next post: Making It… Cool! I loved being there. It was worth every minute. Wow – such a great retreat! I loved seeing all the pics and reading about what everyone did. I hope you consider the San Francisco or Oakland area next time! What a fun time for all that attended! I am attending the next one! A guild friend raved about the wonderful time she had at the first one. I’m looking forward to hearing when Quiltstock 2 is. Thanks for sharing all the photos. …and in Dallas! What fun! I will be watching for the next one! Sounds like a great retreat! Maybe someday I can attend. Perhaps you can have these in large cities across the US. Indianapolis would be a good choice, especially since that is 3 hours from me! Wow, it looks like you all had an amazing time! I was there and it was beyond fabulous! Martingale and Moda thought of everything. No hesitation – I will go again! What a wonderful special event!!! Thank you for the overview of the retreat, Carrie!! Looks like everyone enjoyed a grand time. Martingale and Moda are class operations and I enjoy supporting both. Perhaps Quiltstock 2 will be in my future. I’ve never been to such an event. This looks really great. Where do you hear about the next one? Done in the Moda style!! Sorry I missed it! oooo, I want to know about the next one!! Where/when do I sign up? We have been in the process of moving for most of 2018 so I didn’t decide to go this time. Next year I’m going to be there! Wow!! What a great time everyone seam to be having! Wish I could have been there. Maybe next year! Thanks Carrie for sharing. Shoot, I did not know this existed! When is the next Quiltstock? Wonderful summary of a fantastic week! Thanks for everything. How did I miss this? I thought I was on everyone’s mailing list. When and where is the next one and is there an e-mail list to get updates about it? It looks like a fabulous time. It had great instructors a I bet, so much knowledge shared. Next year! Couldn’t make it this year, but would love to go next year. It looks like it would be a great event to attend – hopefully next year! And I do seriously miss Mervyn’s!! Sign me up…wherever and whenever it happens!! Maybe another one for us international visitors? Would LOVE to attend something like this. Quiltstock 2018 was fabulous! I am very glad my friend decided it wasn’t too expensive after her hubby signed up to go on a fishing trip to Canada the same week The week exceeded my expectations. I especially loved the surprise gifts that greeted us each time we returned to our sewing stations. Thanks Carrie, Lissa, Tammy, Jillian, Roseann, Jennifer, Karen J., Karen S. and the others who’s names I didn’t learn. Each of you helped make the event soooo memorable. This sounds like so much fun – Dallas is not that far from me here in Houston and 5 of my best friends live in Waco! The teaching and the camaraderie sound fabulous. I would definitely be interested in getting information on the next Quilt Stock! This sounds like a wonderful experience! I would have love to have information on the next Quilt Stock. Oh YES!!! Let me know when the next PARTY is…looks great! Really, REALLY interested in next year!! Sign me up!! Oh, would you please come do a retreat in the Southeast? Greenvillle, SC, is a beautiful small city & with in 2 hours of Atlanta & Charlotte This would be a great place for a retreat! I LOVE Moda! Was an amazing event! Loved every minute of it! This sounds like a great retreat for my sister and I to attend together. I live in New Mexico and she’s in North Carolina. A great meet-up and retreat vacation for us. Can’t wait to find out about next year’s event. Can’t wait to hear about QuiltStock 2! I had never been to a quilt retreat…looked forward to this one for 6 months. When it arrived, my friend Diane and I kept pinching ourselves right up until we left!! The hotel and meals, the wonderful new friends! (Quilters are awesome and we met some amazing strong women from everywhere) The sewing kept us busy from early until late! We LOVED it and are so thankful for all of the time spent in preparation. We were spoiled, pampered, showered, taught,…..we rested, we laughed, we ATE (gained WEIGHT! ), and it was a STEAL!! I loved it!! working on my projects and smile with each stitch as I remember my tablemates!! (Betsy and Robin!!!) and the designers!! Thank you to everyone. PS I loved ALL of the Karens!! Sign me up for the next one….. Please please please think about the East Coast for QuiltStock 2!